Ever missed an easy target because the scope wasn’t good enough? Heart-wrenching, right? Finding the right riflescope is crucial in order to hit the target hard. Well, before that, let’s get some insights on what a riflescope is. A riflescope is an excellent device that enables you to have a good view of your target. Vortex is an immensely trusted name when it comes about scopes and the Vortex Diamonds really gives the other companies a run for their money. It’s a high-performance riflescope with excellent durability and reliability. Its solid construction with superior feature will win your heart on the very first try. The Vortex Diamondback is a perfect option for both beginners and professionals. If you’re a frequent shooter who loves having recreational hunting time but don’t want a scope that will cost an arm and leg then the Diamondback is a great fit for you. Its affordability makes a superb option for shooters of all skill levels. The Vortex Diamondback has an allover black look that gives an absolute badass vibe! It’s made with aircraft grade aluminum that adds to the durability of this scope. It has an incredibly tough and robust build that can handle through any extreme condition. It’s super compact and lightweight. The Diamondback is also water-proof, fog-proof and shock-proof. Therefore there will be no such casualties due to the water, fog, and shock that will hinder your sight from the target. It has O-ring seals which prevent it from dust, debris and harsh weather conditions. The Diamondback is very sturdy yet lightweight. It weighs only about 16.2lbs which is just over a pound. It has an overall length of 14.2 inches with a tube size of 1 inch. It’s an ideal choice for the people who hate adding up extra weight to their firearms. Even though the Vortex Diamondback comes with a modest price-tag but it’s no less than an expensive scope. It has a 4 to 12 zoom range with a 3x zoom lens. It comes with a lens diameter of 40mm with a field view of 2.6 meters on one hundred meters at the lowest setting and 7.9 meters on one hundred meters at the highest magnification setting. It has fully multi-coated optics which helps to increase the light transmitted by this scope. The anti-reflective property of the coating ensures that the shooter gets best light transmission without target illumination feature. The adjustment setting for magnification is attached on the back part of the eyepiece. You can easily see the numbers, therefore, it’s easy to decide how much zoom you want. 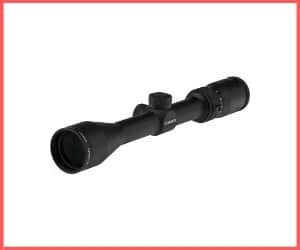 This scope offers excellent performance up to 600-800 yard. Anything beyond that might not be clearly seen so if you’re a long range shooter, you might opt for a different model. It has consistent tunnel effect and it provides outstanding sharpness in all magnification level. However, a bigger field of view would have added more value to it. Many times people tend to overlook this feature because they’re not quite known to the use of it. Eye relief id the distance that you can maintain between the scope and the eyes, and yet get a full view on the target. This feature is a really important consideration as you need to put down your face near a firearm with a scope on as it recoils. This is even more crucial to people who wear glasses. Riflescopes have a standard eye relief about 3.5 inches and this might not be ideal for rifles with heavy recoil. But, no worries! The Diamondback gives a 3.7 inches eye relief which is plenty enough for everyone, even for the people with glasses. The Diamondback uses VMR-1 Reticle. It’s based on Minutes of Angle (MOA) and the reticle is not illuminated on this device, therefore, it’s not an ideal choice during sundown. The Vortex Diamondback is equipped with capped turrets that are used for elevation and windage. Every click on the knob is equivalent to 1/4 MOA which is a move of about 0.25 inches at 100 yards per click. The real charm about the Vortex Diamondback is its warranty. You get no-question-asked VIP warranty with this purchase. You’ll get a full refund or repair absolutely no question asked about ownership or receipt. Sound like a dream, right? The Vortex Diamondback may not be the best scope money can buy but it’s one of the best in its price category. It offers incredible durability with crystal clear vision that will certainly take you hunting experience to the next level. Ans: Yes, the Diamondback is compatible with AR-15. What type of reticle does this scope have? Ans: The Diamondback is a 4x X 12x X 40mm objective scope that features a V-Plex reticle.